“We will temporarily be closing INR related trading pairs at 5 p.m. on Wednesday 5 Sep 2018. At that time, all pending orders involving INR pairs will be cancelled. 5PM Indian time is 12:30 London time. 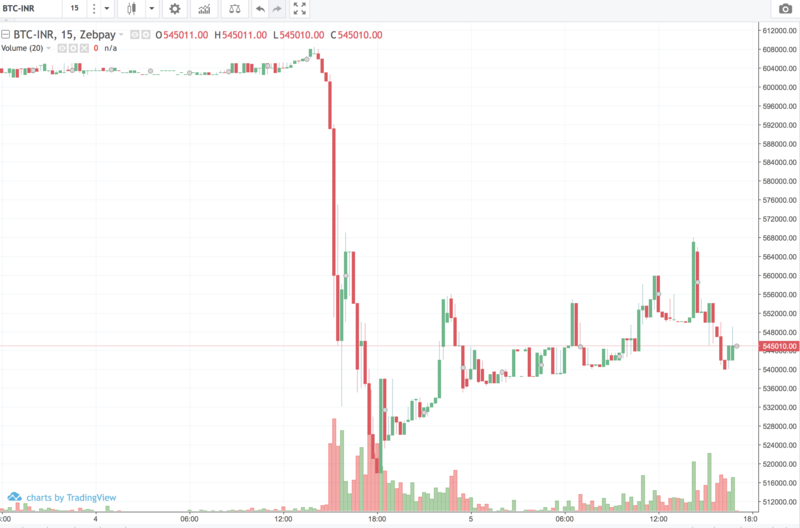 At about 10:47AM London time this morning most cryptos saw a flash-sell off when at least 200,000 eth were exchanged just on Bitfinex. Bitcoin saw a quick price fall by just $300, but in India it fell by more than $1,000 according to price data from Zebpay. Bitcoin’s price in India, Sep 2018. According to Google conversion data, some 600,000 Indian Rupee is worth about $8,500. That bitcoin premium almost evaporated with bitcoin’s price seeing a flash sale beginning at around 12:30 according to the above chart. It reached a low of 520,000 rupees, worth $7,263. Making it a $1,300 price drop yesterday within about one hour. Global prices, in contrast, saw little if any price movement yesterday. Bitcoin’s price then somewhat recovered in India, reaching 570,000 rupees, or $7,960, before dropping a bit today to $7,600. That may suggest there might have been some sort of arbitrage that may have taken a day for it to be reflected in global crypto prices as yesterday’s bitcoin price chart in India looks quite similar to today’s global bitcoin price action – although more pronounced – and more prominently eth which saw a 20% drop. India’s Central Bank has banned commercial banks from serving crypto entities with an appeal process on-going but in the meantime exchanges in India can not handle fiat. What fiat was on the exchanges, however, might have allowed for some sort of arbitrage or ownership movement, by perhaps selling accounts and so on, but Zebpay is now sending all that fiat back and is, in effect, closing off the Indian Rupee trading pair. That probably had an effect on global prices as little else seems to be blamed for the unusual flash sell-off that greeted this American morning.